The building of a European Digital Library requires a cooperative and distributed development model that, as far as possible, promotes the sharing and reuse of current Digital Library products. In order to support this model, an abstract solution to the problem of implementing a Digital Library - in other words, a reference architecture - is fundamental. After about fifteen years of Digital Library (DL) research, development and deployment the research community is now well versed in the successes and weaknesses of the field. Until now a pragmatic approach has been adopted in developing systems via specialized methodologies, usually by adapting techniques borrowed from other disciplines. This approach has produced a plethora of heterogeneous entities and systems – commonly classified as 'digital library systems' – and has resulted in a lack of agreement on what should constitute the fundamental aspects of DL technology. This makes the interoperability, reuse, sharing, and cooperative development of DLs extremely difficult. Moreover, the role played by DLs undergoes continuous evolution, making current systems inadequate for future applications. Modern DLs are conceived as systems to support the whole process of dealing with human knowledge production, maintenance and communication. To overcome these limitations and lay the foundations upon which to build future DL systems, the DELOS Network of Excellence on Digital Libraries is promoting an activity, lead by ISTI-CNR, aimed at producing a Digital Library Reference Model. A reference model is an abstract framework for describing and understanding the significant relationships between entities in an environment. It consists of a minimal set of unifying concepts and relationships within a problem domain and is usually independent of specific standards, technology, implementations or other concrete details. Its goal is to enable the development and integration of systems by using consistent standards or specifications supporting that environment. The core of this model is being developed by a consortium that includes, in addition to ISTI-CNR, four other partners: the University of Athens (GR), the University of Glasgow (UK), the University for Health Informatics and Technology (AU), and the University of Basel (CH). One of the main outcomes of this work is the Digital Library System Reference Architecture depicted in Figure 1, which provides an abstract solution to the problem of organizing and implementing DL systems. This reference architecture is based on a loosely coupled component-oriented approach. Such an approach is fundamental for the purposes of the reference architecture, since it allows for: (i) easy tailoring of the DL through component selection and replacement; (ii) reuse of the components in different contexts; (iii) distributed installation (since each component can be independently implemented); and (iv) easy support for heterogeneity issues by using or providing an appropriate component dealing with the particular issue. The Digital Library System Reference Architecture. 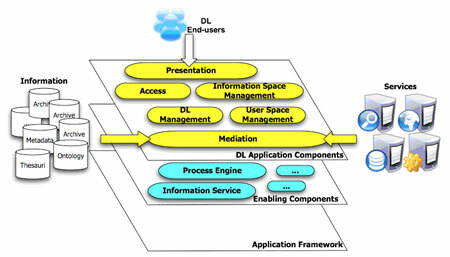 Together with the component-oriented approach we also adopt a layered approach, and organize the constituent components into three tiers: (i) the Application Framework, ie the set of libraries and subsystems supporting the operation of the other DL system components; (ii) the Enabling Components, which provide the functionality required to support cooperation among the components implementing the DL application; and (iii) the DL Application Components, which provide the DL functionality specific to end users. The components that constitute the DL Application Components tier are further organized into functional areas. Mediation components deal with and provide access to third-party information and services that vary in structure, format, media and physical representation. Information Space Management components implement and manage the DL information objects by providing storage and preservation facilities. Access components support the discovery of DL information objects via search and browse facilities. User Space Management components provide for registration and activities concerning administration of the users. DL Management components aid the administration of the DL in terms of the librarian activity, eg review processes, policy management and preservation activities. Finally, Presentation components provide users with simple access to the DL information and services, namely the graphical user interface. In order to test this model and prove its effectiveness, a DELOS DL system prototype is being implemented. The goal is to combine existing software and technologies produced by members of DELOS, and use the guidelines provided by the Reference Architecture to build a prototype. One of the first outcomes of this activity is identifying the most appropriate current technologies: the proposed component-oriented approach dovetails with the service-oriented approach and promotes the usage of P2P and Grid technologies. These activities, ie the Digital Library Reference Model and the DL system Reference Architecture with its preliminary implementation, are the topics of a DELOS Workshop. The workshop took place in June 2006 in Rome, and involved leading DL researchers. The objective of the workshop was to discuss the current model and to plan future activities and collaborations to build on this foundational work.